Arthur Nicholls was born in Beeston in 18912, the son of Abraham (b. 1849, Stanground. Hunts) and Sarah Nicholls (b. c1852, Creeton, Lincs, née Dennison). George was the tenth of their twelve children, the second youngest of their six sons3. His parents had moved to Beeston with their oldest children, around 1875, to live at 16 Union Street (Wallace Villas) from where Abraham traded as a carter and coal dealer4. By 1911, Arthur had started work as a moulder in an iron foundry. Although we don't have a precise date, it appears likely that Arthur Nicholls enlisted early in the War, signing up with the Sherwood Foresters (Notts & Derby) Regiment. Although he was serving with 11th Battalion at the time he was killed, it appears that he served first with another battalion - perhaps 2nd Battalion - as he is recorded as having landed in France on 22 June 1915, some two months before the arrival of 11th Battalion - possible part of a contingent of 60 men which reinforced 2nd Battalion, part of 6th Division, at Proven on 23 June 1915.5. By the last days of June 1916, 11th Battalion was part of the preparations for what was to be the great Somme offensive against the German held Leipzig Salient. During this time, the German lines were pounded by artillery fire which was so intense at times that it was thought that the enemy defences would be so destroyed as to make the intended major attack possible. Bad weather delayed the attack intended for 28th June and the Battalion, consisting of 27 Officers and 710 other ranks, was held in trenches in front of Authuile Wood awaiting orders to attack. Its role was to be in support of 8th Battalion York & Lancaster Regiment which was to lead the attack. At 7.30am on 1st July, the first wave attacked followed by 11th Battalion Sherwood Foresters. They had been told to expect little resistance and the wire destroyed. Instead, they were caught in withering fire - both enfilade and from the flanks - from enemy machine guns and much of the wire was still in place, largely untouched by the bombardment. No Mans Land was particularly wide at this part of the front and casualties were formidable, particularly with 11th Sherwoods, which also encountered many dead and dying from the leading waves. It was estimated at the time that at least 500 of the 600 men who went over the top were casualties - largely confirmed by a count of those who remained at the end of the day, only 6 officers and 202 men6. Private Nicholls was one of those killed in this terrible attack. Private Nicholls' body was never found and he is commemorated on the Thiepval Memorial, which now stands adjacent to the Leipzig Redoubt. 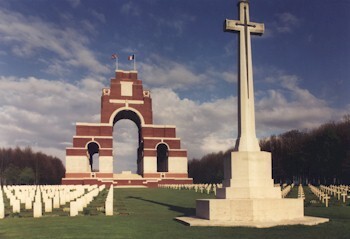 The Thiepval War Memorial to the Missing was unveiled on the 1st August 1932 by the then Prince of Wales and is the largest British War Memorial in the world. Standing 150 feet high, it dominates the surrounding area. The memorial stands on a concrete raft 10ft thick, built 19ft below the ground, the solution to the problems of building over the warren of tunnels that formed the German second line. Designed by Sir Edwin Lutyens the memorial has sixteen masonry piers, where can be found, on the panel faces, the names of some 72,000 British and 830 South African soldiers who died and have no known grave, during the period starting in July 1915, when the British Third Army took over from the French, through the Somme battles of 1916, until 20th March 1918, the eve of the last great German offensive on the Somme. The focal point of the memorial is the Stone of Remembrance, which lies under the great arch and centrally between the piers, for which Rudyard Kipling chose a quotation from Ecclesiasticus, "There name liveth forevermore". 2His birth was recorded in Basford Registration District (of which Beeston was part) in Q3/1891 (Ref 7b 186). 3Arthur's siblings were Walter (b. c1872), Ann Maria (b. 1873), Emily (b. 1875), John William (b c1877), Emily (b. c1879), Henry (b. c1880), Catherine (b.1883), Alfred (b. c1887), Ellen (b. c1889), Samuel Denison (b. 1893) & Ethel (b. c1896). 5Arthur's Army Service Record does not survive. The date of his arrival in France is from his Medal Card. Reference to the arrival of a contingent of 60 men is in the 2nd Battalion War Diary. His entry in the WW1 Service Medal & Award Rolls records that he was attached to both 2nd and 11th Battalion Sherwood Foresters. 6This account is based on 11th Battalion's war diary and "The Men from the Greenwood", a war history of 11th Battalion by Percy Fryer. 8Sarah Nicholls died on 22 October 1936, aged 84, followed by Abraham, her husband, on 8 January 1937.